so goes another hollywood movie line to shake the very core of our beliefs. 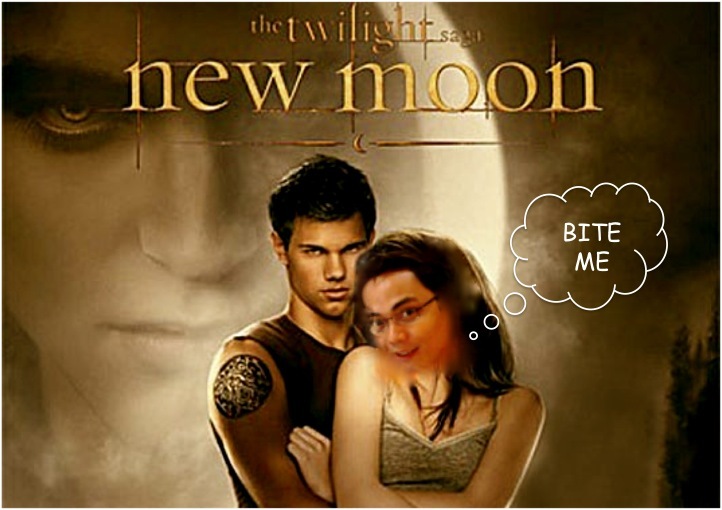 jp and i watched new moon because everybody else did (so much for personal integrity). the prospect of buff half-naked boys prancing around the jungle, acting like drooling dogs, made succumbing to pop-culture peer pressure a little easier. truth be told, it wasn’t half bad. i’ve always had low expectations for books having movie tie-ins. it’s just usually just a tad better than their gaming counterparts. i came home after the movie with an inexplicable urge to sort that line out in my mind. make sense. what makes sense? 1+1 = 2. that makes sense, and then very little else do. even more so when it comes to love. true, some studies linking love to a feeling of elation produced by a combination of hormones released by specific parts of the brain to ensure progeny makes sense. but to reduce all that drama to something hormonal is too lose all the romantic and spiritual significance we assign to it. so i was thinking, do we want love to make sense, anyway? personally, i don't think love can make sense even if i want it to. however, i believe i have to make sense even if my feelings don't. and going back to the movie: for instance - this thing about edward and jacob. sure, i am not averse to the odd threeway when it is called for. but to expect it to happen with a werewolf and a vampire? what was she thinking? love doesn't make sense because we don't have time to make sense of it. and when we do, we lose it. @ id - is time the determining factor? @id: then maybe it wasn't really love but the will to power. @kiel: we haven't seen it yet, but i saw the first one and was affected by it (i mean, the vampire is like 120 years old... could you imagine how inappropriate it would be for a 120 year old to date a 17 year old, regardless of whether he looks like a 17 year old?) it will be interesting how they add to that in this installment. putik! sabi ko na nga ba si Dakota Fanning yun e.
bakit kaya hindi nila sinama sa soundtrack ang kantang 3 ni britney spears. @ scheez - team jacob? @ don - hayyy! bitteresa ka kaya mader? "the prospect of buff half-naked boys prancing around the jungle, acting like drooling dogs, made succumbing to pop-culture peer pressure a little easier." this really, really got me. haha.